you 'tehadisowoch' /reformers/ and you foolish supporters please think what you are doing and with whom you are struggling- in your heart! you supporters please be the flower of the church and to its Protector- Jesus Christ rather than bein...g an emotional supporter of ordinary men! The Bible says: 'Therefore be wise as serpents and harmless as doves' Matt. 10:16. Notice that reformers are striving to make our church like they did on Indian orth. church and I think they have a secret full relation with them. so let us safeguard our church from these false brothers with help of God by respecting the commands of the church and by standing on behalf of the rules enacted by the Holy Synod. Let we unit under the umbrella of our church and let we abash this heretical movements made by the false brothers. Are going to expose the network? Are you sure to have rich document. I don't think all the documents and evidences to be exposed for everybody. I don't like your approach of dissiminating information. you are giving a chance for hide & time for counter measure. I like the organized,rich facts and figures to convince others(specially the fathers). Like what M.zemedkun did in his CD. unless and other wise it can be conidered as gossip,false Accusation. Let's go to dubai and see how the children of the church handle this problem. Take hawas's as a model. Ersu beTEWAHIDO KIRISTINA lay zemechawun beyifa makomun kalasawoke endet yikomal bileh tasibaleh SEFARI!!! Antem tikikilegna simihin nigerenina enwokih b/c woy Begashaw rasu neh aliyam kemenafkan andu!!! Dejeselamoch beyegizewu lemetasnebebun yebetekerstia merejawoch Egziabher wagachihun yekfelachehu. Enezih yewust arbegna tehadsowochen beteley manenetachewen kemagalet betechemari akahedachewun, seltawi asebabekachewun ena ye qusaqus ena genzeb menchachewenem magaletu ende betekerstian lejenetachehu yemitebekbachehun adergachehual eyaderegachehum new.Ene lezih blog anbabiwoch bemulu enezihen atserare betekerstian ke magalet beterefe egna sele betekerstian tenqeqen ke ewunetegnochu hawariat memheran memar, be betekrstiantua mewaqer hulu agelglot mestet, éyetefetu yalu yeabnet temehret betochen medegom, asrat bekuratchene beagbabu lebetekrstian mawutat, beteleyayu quanquawoch teteki memhranen maselten bemichalebet projektoch mesatef benechel melkam new elallehu. Yalezia gen kenfer bemetetna zena bemanbeb becha yemimeta neger aynorm elallehu. Egziabher yestilegn. Here in north America, some people think Tehadeso( Protestant in orthodox cover)as imaginary stuff. Some of the above comments show typical Tehadso words.Here one example:- "yekiristosin kibir lelelaw madireg new sirachew.. ". The Anonymous poster literally mean that don't preach about saints. 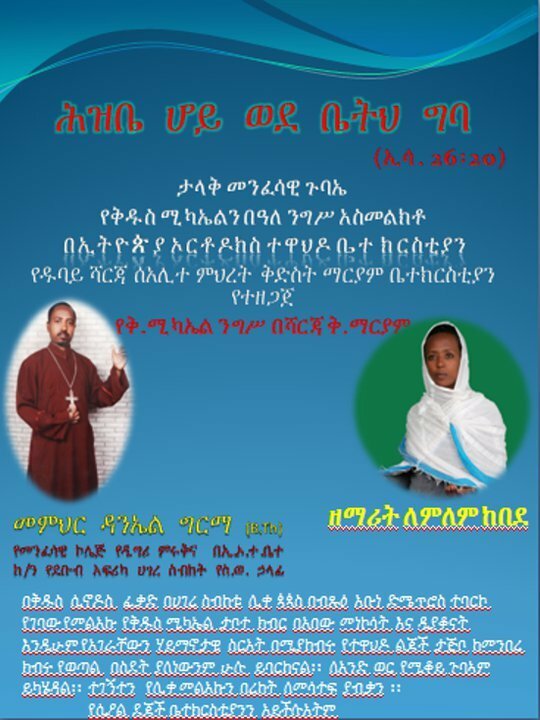 ወይ አምላከ እስራኤል እዚህ በጥብጠው በጥብጠው ሲነቃባቸው ድግሞ ዱባይ ሄዱ እዛ ያሉትን ምዕመናን ደግሞ ግራ ሊያጋቡ ምናለ የሚመለከታቸው ቢያግዷቸው አቤት አቤት እኔስ ተቃጥዬ መሞቴ ነው አቤቱ እግዚአብሄር ሆይ ይቅር በለን!!!!!! sick and tiedr of deje erkusan ye politica maheber ur dioing this edmeachun lemarazem.neketenal ..ur time is done .. othodxawit cherchanchen temelsa atankelafam endalefwo zemen..
Each of the so-called preacher, psalter,choir,teacher, archbishop and patriarch is falsified by you. Therefore, to whom we can follow, hear, listen, and accept? በእውነቱ የቅዱስ ሚካኤል ቤተ ክርስትያን ብለው የከፈቱት ከቤተክርስትያንዋ ዶግማና ቀኖና ውጪ ስለመሆኑ ሁላችን እናውቃለን እሺ እነዚህ የሰበካ ጉባኤ አባላት አያውቁም አልተማሩም እንበል ነገር ግን ዘማሪ መምህር የተባሉት ወንድሞችና እህቶች ስለ ቤተክርስትያንዋ ህግ ሳያውቁ እነዴት መምህር ተባሉ እንዴትስ ዘማርያን ሊባሉ ቻሉ ይህ አጠያያቂ ነገር ነው ወገን እከሌ እከሌ ብለህ ከምትጨቃጨቅ እራስህ ሰው ምን ይላል ሳይሆን ቤተክርስትያንዋ ምን ትላለች ማለት በቂ ነው እኮ በሀገረ ስብከቱ ሊቀጳጳስ አመልካችነት በሲኖዶሱ ትእዛዝ መተው ያወገዙ አባቶች ከአንዱ በቀር ሌሎቹ እኮ አሉ እራሱም ሲኖዶሱ የቤ/ንዋ የበላይ የሆነው እኮ አለ አልተበተነም ምን ሆናችሁ ነው የብትጨቃጨቁት ቤ/ንው የቃል ሳይሆን የፅሁፍ ህግ ያላት እኮ ነች አትስረቅ ከተባለ አትስረቅ ነው እንጂ ይህን ስረቅ ይህን አትስረቅ ማለት አይደለም.ስለዚህ ቅዱስ ሲኖዶስ ያወገዛቸውን እንዴት አድርጎ ነው አንድ መምህርና ዘማሪ ሊያገለግልበት የሚችለው ያሄ ኢኮ ከስርአት ውጪ ነው ማለት ነው ቤተክርስትያኑ የተወገዘ ከሆነ ምእመኑን መክሮ መመለስ ነው እንጂ ሄዶ ማገልገልማ በርታ ምንም ችግር የለውም ሲኖዶስ አያስፈልግም ማለታቸው ነው ማለት ነው.ይህን የሚያደርጉ ደግሞ ከኛ አለመሆናቸው በትክክል ያሳውቀናል.ስለዚህ ደጀሰላም እንዲህ አለች እከሌ እነዲህ አልክ ሳይሆን ህጉ ምን ይላል ቤተክርስትያንዋ በቅዱስ ሲኖዶስ ትመራልች ወይ በየትኛው ሀገረ ስብከት ስር ነች ማለት ያስፈልጋል. ለሁሉም ድንግል ማርያም አፅራረ ቤተክርስትያንን ከስር ነቅላ ታውጣልን. Let us work on strengthening the Holy Synod. If the Holy Synod is strong we will solve 90% of our problems. Otherwise these things will divide us and will not stop. If we want to solve the problems we should focus on having a synod whose decisions will be implemented, synod that will be fully respected by its members and laity. If the synod has unity and makes decisions we are ready to fight any one based on that rule. Now it seems very confusing. I personally don't like Begashaw's way, he is too childish and self declaring. If guys who have contact with him read this message, please tell him to learn at least from our elder brothers like Zebene, Dejenie and Zelalem. As far as the synod doesn't make a statement prohibiting him from preaching we cannot prevent him or our opposition will not be helpful except making divisions. Any member of the EOTC should be abided by its rules and regulations. We should not allow some once intervention. Any chapel (Atibia) like st.Michael established without knowledge and prayer of Fathers is not acceptable by any means. Yehe ko irkus menfes new.Ine teenagerem hone yehe betam yassazinal.Igzeabehare yesewire kemaat.Yeethiopia betecristayen yekoyech kidist nat.Metadese yalebachew enusu nachew!Saytan kealem yetfa.Bedubay laiy betecristayen igzeabehare selakomelachew mamesgen yegebachewal.Enusuchirash reformers iyalu yejemeralu.Igzeabehare indaye athefahew new mi tseliyew.ye milutin ayakum. ene ferahu yegna endieh mehon leleloch ber endeikeft!!!!!! EBAKACHEHU DEGE SELAMOCH KEABATOCH GARA TENEGAGRACHEHU TSOM YEMITAWEGEBETEN MENGED YEFELEG; SEW LEGELU TEKEM SELETN YESALAL YETSOMAL MENEW YEBETEKERESTIAN SIHON ZEM TEBALE YEHEKO KELAL NEGER AYDELEM!!! I have been reading dejeselam recently and got it to be interesting with some of the news updates. But now, what i am seeing is some boring gossiping and typical characteristic of yemender arogit werea. Guys, instead of presenting always biased info....please try to be an insider in all area including mahibere kidusan. This guys might have truth also. so be neutral or else you will be regarded as one of the typical cowards found in the church. pls pls le mindinew bematawkut neger yemtdakirut . Ebakachu ende christian enasib ersbersachin enwaded , dubai lay 1 aydelem 10 church biseras yehen yahil yemiyanegager new endie, pls be bizu chigir yemingelatawin hizib bemayihon werie atadenagrut , hizbu huletum gar megelgel yichilal , ye astedader chigirin lemndinew ye betchrstain chigir new yemtilut? ebakachu le wongel mesfafat begara binsera yishalal enji mekases aytekimim , ye gileseb sim eytekesu endih endih new malet asafari neger new,degmom tawkalachu enzihu simacheiwn kelay yetekasachuawachew astemariyowch addis ababa be yeadbaratu wist endemisebiku, lewedefitu erimt wisedu . Beterefe amlak haymanotachinin yitebkilin !!!! Once i used to live there and i knew very well whats going on there. As a human and positive thinker we might said that preaching and teaching people is important that other things.Many people still think and see only from up but they don't realize whats is behind it. Those people intentions whom establishes a new church by name of " kidus mekayel" was not to help or to teach fellow orthodox Christians but just to show their superiority, ignorance, disrespect for others. this people they used to work as sebeta gubaye at Sharjah church once up on a time but when they start to think that they can do anything because of they huge amount of cash flow they have or the support they got from senodos , the people itself push them out. 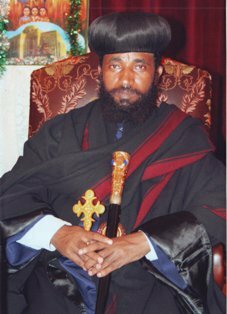 As we declare ourselves as Orthodox Thewahedo follower , must we respect, understand , follow,teach and accept the rules ( keneno). these rules are not new or been introduced yesterday.these rules are a basic foundation of orthodox thewahedo. we don't have a right to change them when we feel so or make them in our way because of opposing somebody. but this rules are made by by our grand grand fathers who sacrifices their life for it. There is no compromising in religion.we can not change them according to our preferences. If we are blessed, we must give our life for it in order to pass it to next generation. 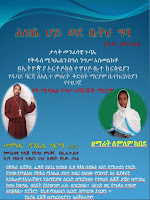 ይድረስ ለደጀ ሰላሞች፣ እንደምን አላችሁ ሳይደግስ አየይጣላም አይደል የሚባለው! በዚህ የነውጥ ሰዓት እናንተን ከ4 ዓመተት በፊት አስቀድሞ ያስነሳ አምላክ የተመሰገነ ይሁን! እናንተ እየተዋደቃችሁበት ያለውን የጦር ሜዳ (ይህ ቴክኖሎጅ)እዲፈጠር ያደረገ ገናናው አምላካችን ክብርነና ምስጋና ለእሱ ይሁን! አደራ ይህ እግዚአብሔር የጣለባችሁ ሃላፊነት ይቀጥል! መደባችሁ ግኖስቲክ፣ ሉተር፣ ወይስ ማነው? 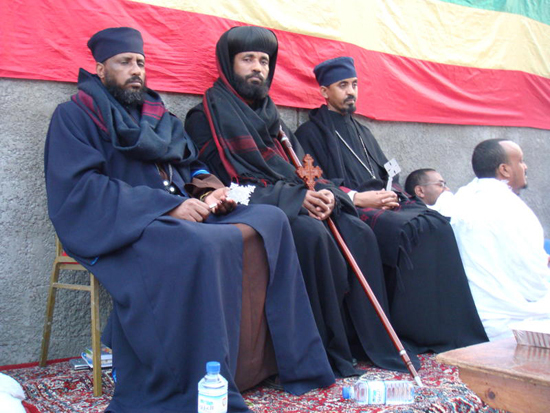 on the day of Kuskuam i was at Kality kuskuam mariam... there was abune Paulos for the ceremony... then Getachew Dony read a report about abune paulos for about 30 minute...on the report there is a word llike this... 'Abune paulos tsilat bikeretslachew enkuan ayansachewem' what is that mean really? are those guys really christians? i doubt it... And at that time Abune Qewustos was there too and does nothing... do we hear such a things and shut our mouth? I did not know that this web is administered by "mehaber sitan." I have reason yesterday I sent my comment by just supporting the preaching of the gospel , I do not understand why you did not post. I do think you are doing a good thing for our church. you will get the price from top(God). Tenegro alimeles kales? Awugzo meleyet newa. ቸሩ ፈጣሪያችን አስተዋይ ሕሊና ቅን ልቦና ያድለን፡፡ አሜን!! Dear መርከቤ ንጉሴ you have a point! Why don't you advise him and update us what he will say.He might say "Tesadbeyalewu ahunim esadebalehu..."
Bekdmiya Yihin Silasnebebachihun Egziabhear Yibarkachihu. Awe bewekitu yedubai guday lay ene neberku, yihn yahil yemiyakefafil dereja yemiders alineberem. Behulum bekul mechachal kena asteyayet belemenoru new. yegudayu menshie yehonut ahun bebotaw yelum kehuletum bekul neger gin betekrstian eskahun titawekalech silezih. Endenie endenie lebete kirstian yemitekmewun amelekaket binyiz. Minew ahun yih neger genene dubai lay gubaye silemiaydergu new. minew Addis Ababa astebabirew yewosedut genzeb aydelm endie kemsirachu gar yatalachew. Sew kistetu kaltemare Nisiha tirgum yatal malet new. Andie Axum hotel Ethiopia, Bezihu wengel mahiber sim bizu genzeb sebsibew hidewal bewektu hulunim bekihinetm yebotaw like papasim yawukalu. Silezih ahun min yihun new yemibale mimenu yemimelesew bekena gilgalot new. Enersu kemisebesebubet betekirstian and ken bekuwaminet yesibket wugel mekifet yih tnish likenis yichilal elalehu.